Most likely new game and new gameplay, but definitely taking strong inspiration from Battlezone. I have some interesting ideas I want to experiment with. The core of it is still built on BZ-style vehicles / weapons etc, and some kind of RTS element eventually (long way off though). FPS / RTS Hybrids never really seem to do very well, which is a shame really. Changing the way the game works, especially in terms of the RTS element to make things faster paced and lower the barrier to entry is the way to approach it I think. I liked Nielk1's 'Reactor Wars' mode for example, something like that with MOBA elements might be quite interesting. Shamelessly ripped an Elite Dangerous cockpit from the Direct X pipeline (WHY are there no decent free 3D cockpit models out there?!) to see what it looks like with a nice cockpit.. 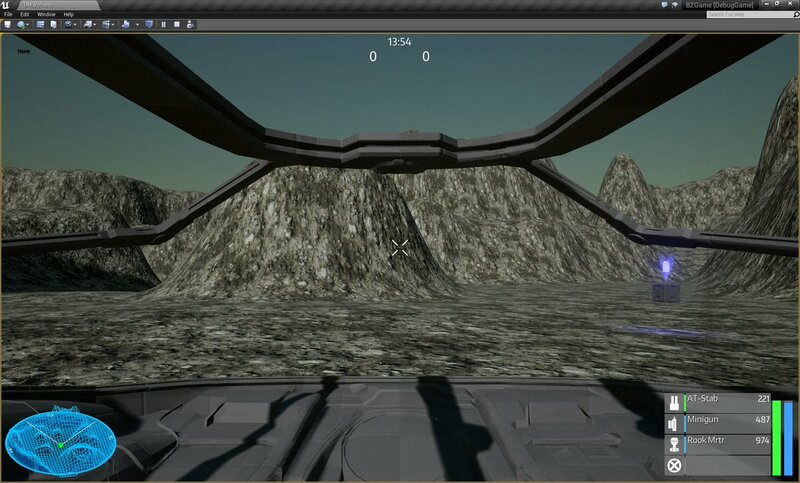 Strongly considering moving to a 3D ui for first-person vehicles. Very pretty! I love that HUD. Merry Xmas my fellow BZ fans! I did notice in your Christmas video something that makes me feel like the projectile is speeding up when it leaves the barrel of your tank: The enemy tank gets bumped around quite a bit by the shell but there's nearly zero kick (or perceived kick) in your ship. That's easy enough to tweak though. Are you going to write this game to use the Microsoft ForceFeedback drivers? Playing BZII with a Microsoft ForceFeedback 2 Joystick is a real joy if you've ever gotten the chance. I recommend it over any other for BZII and Mech Warrior. I hate to say the last time I got to work on this project at all was about the same time I uploaded that video. The original idea was to bring it into *real* production last March, but unfortunately my co-founder left and I had to try and fund a smaller project. I did build force-feedback into things like weapon use actually, but never got around to testing it. In theory if a device supports force feedback, it should all hook up!